It's the sort of story that's surprising yet pretty much what you've come to expect from Mayo Clinic and the Sisters of Saint Francis. The Sisters and the Mayos joined forces to build a hospital to care for the medical needs of folks in Rochester, Minnesota, after the great cyclone of 1883. The Sisters said they'd build the hospital if the doctors Mayo would serve as the medical staff. And so a hospital was built and scheduled to open Oct. 1, 1889. Fittingly, it opened a day early to meet the needs of its first patient. "It wasn't supposed to open until the first of October. But it opened the day before because a patient needed surgery," Sister Generose Gervais tells the Rochester Post-Bulletin. Sister Generose and Sister Lauren Weinandt, Saint Marys' archivist, met with Post-Bulletin reporter Jeff Hansel last week to talk a little hospital history. The good Sisters tell a compelling tale about the sacrifices of their predecessors to ensure the legacy of the hospital. The hospital was initially staffed by five Sisters, they tell the P-B. 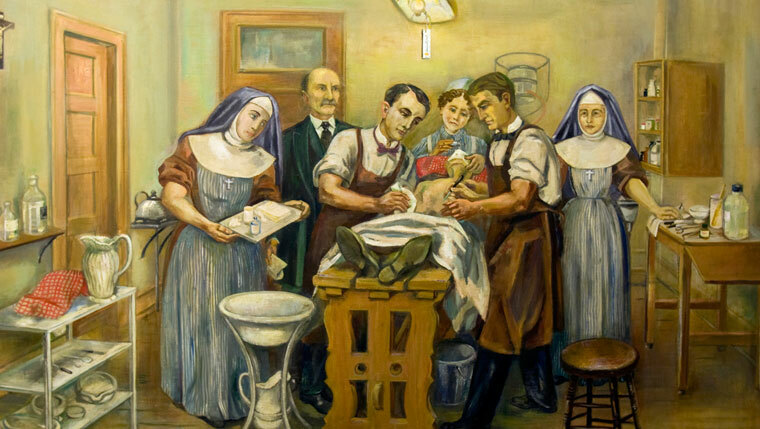 As the hospital was relatively frill-free, they pumped water by hand that was "carried from the basement" and used for "cooking, cleaning, bathing" and drinking water, Sister Lauren recounts. "The poverty of the sisters, and how they saved, is the reason we have what we have today ... "They lived very frugally." The two Sisters told of how the order's leader in those days, Mother Alfred Moes, "wore shoes that she made out of cloth" and saved her store-bought shoes "that she got for a dollar-and-a-half" for work outside the hospital. They also talked of how the Sisters worked long hours, spent evenings cleaning patient rooms, took care of laundry, and studiously scrubbed utensils that were "made of iron." And when hospital beds were full, "the sisters surrendered theirs." As Hansel writes, "It became a normal nightly duty for the sisters to prepare spots on the floor upon which to sleep." That is, unless it was their turn to stand guard at the elevator "to protect people from walking into the (open) shaft." * Dr. W.W. Mayo never operated at Saint Marys. Typically, his sons Dr. Will and Charlie operated while Dr. W.W. Mayo administered the anesthesia. * There has always been a chapel at Saint Marys. The current chapel is the oldest part of the current hospital. * The chapel is designed as a basilica, distinguished by the granite pillars crowned with arches. Artists from Italy created the ceiling castings. The Sisters thought patients "deserved the very best." * Saint Marys has been smoke-free for 125 years, making it one of the first (if not the first) in the nation. The Sisters told the P-B a story about "three or four sisters" carrying a man "up to the third floor (on a cot) so that this man could smoke." * The Sisters continue their work today. The Poverello Foundation has helped more than 8,000 Saint Marys patients pay their bills. Mass to celebrate the hospital's 125th was held yesterday (yes, a day early), and included a blessing of the newly refurbished pipe organ. Dig into a little Saint Marys history for yourself here, here and here. Then share a few tales of your own and share these stories with others via the In the Loop blog.